"Lighter. Stronger. Faster...and now Shorter. Introducing Kahele, a dynamic new OC1 design." At 19'3", the new Kahele (pronounced KAH-heh-leh) pairs the manageability of less size with a progressive approach to canoe design. 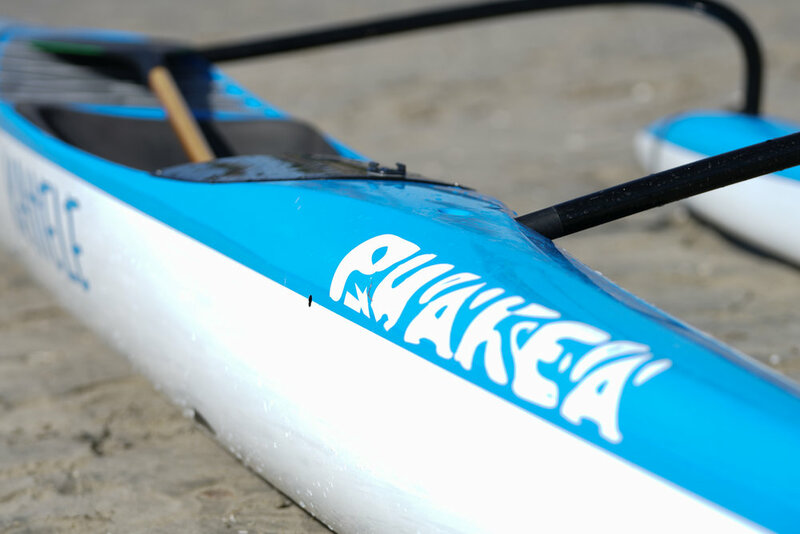 The Kahele is designed for improved efficiency by eliminating length in the nose and tail of the canoe. The Kahele features an optimized waterline of about 19 feet. 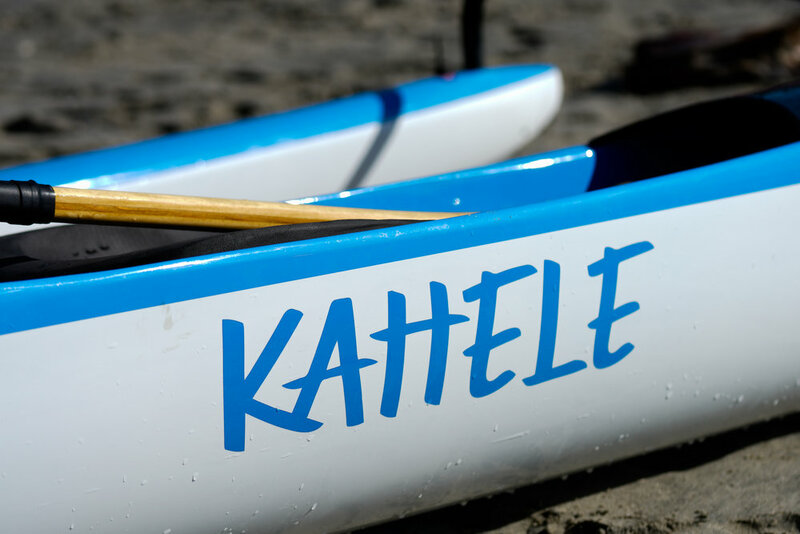 Kahele, meaning "to move", is easy to manage both on and off the water. 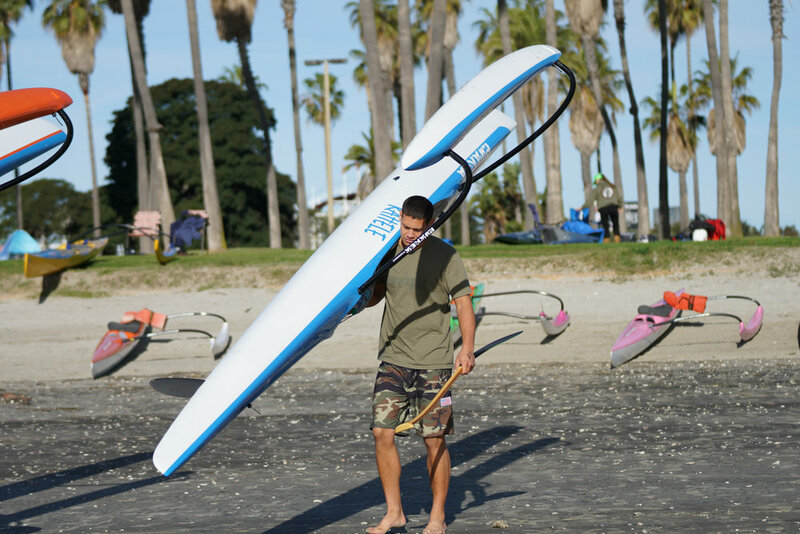 Although appealing to lighter paddlers looking for less to move around, Kahele also stands out for paddlers of all sizes due to its revolutionary design. It's compact, maneuverable size enables it to catch swell and jump over the bump in front with less effort. It also fits neatly in the trough between bumps so you don't get stuck and lose momentum. Johnny had an idea, as he watched canoes and analyzed footage, something stood out. "About one foot on each end of an OC1 does not serve the goal of moving the boat forward with efficiency. In fact, in flat water, this extra surface area is out of the water and has no value at all. And in the wind, it means more canoe gets pushed around with the additional surface area." says Johnny. This thought kicked off a chain reaction. Looking at the values and progress brought about by the Kahe Kai it was time to weigh out where to go next. Trimming the length, and adding volume in specific areas Johnny arrived at the revolutionary design, Kahele. 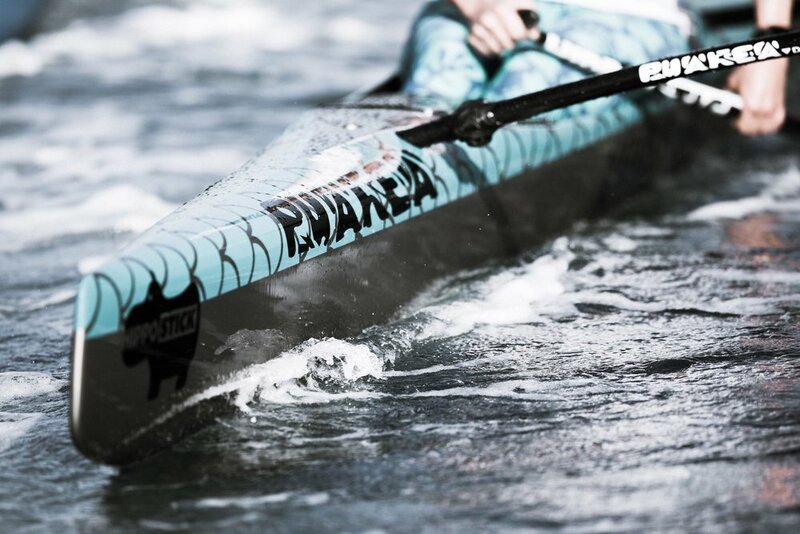 Although perfect for flat water, the Kahele executes in downwind and rough water in a way that is changing how we understand downwind paddling performance. 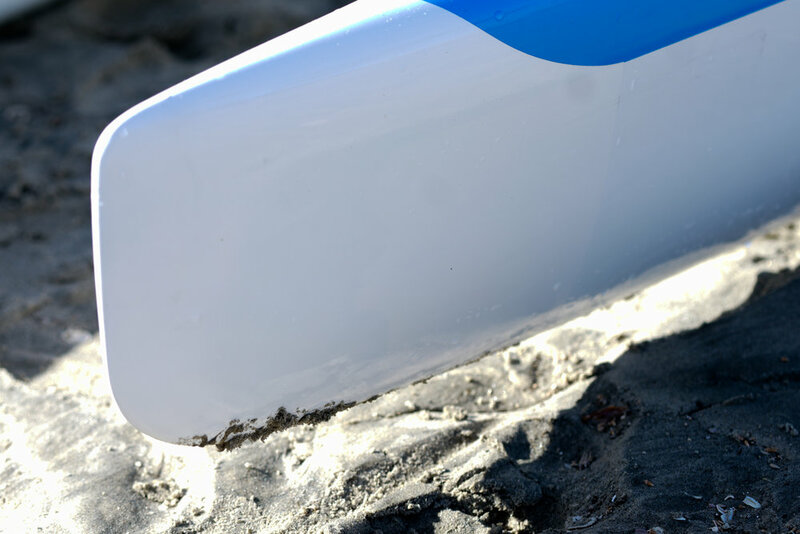 "The stout design of the Kahele really delivers on rougher days and in the swell. It minimizes the front-to-back shifting on bumps. By omitting surface area and length we have essentially reduced the effect of friction and unwanted movement caused by waves, chop and moving water." The deck of the Kahele is designed for improved efficiency, with a low profile and aerodynamic shape. 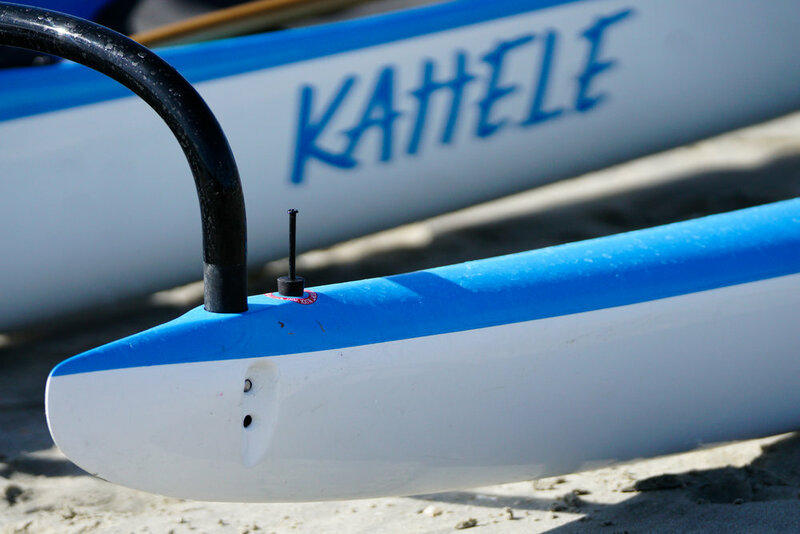 The Kahele features a plumb bow to cut sharply through the water. Featuring the popular carbon fiber footwell cover to keep the wind, sun, and water out. This cover not only protects your feet from the elements, but at 8 lbs a gallon, prevents the buildup of 20 lbs of water that would otherwise pool in the footwell before draining out. The Kahele fits in most garages. It can also be shipped in a 20 ft container, making it cheaper and much easier to take with you on your next faraway adventure. The Kahele also comes in the Pro Model at 16lbs. plus other upgrades! More info here. "Took the Kahele Pro out today with two buddies and went to Maliko. Conditions were 10 to 15 knot breeze and two to three foot swells. The canoe is absolutely perfect, just like butter! I can say that it really picks up the bumps quickly. It accelerates amazingly and is very maneuverable, as well as comfortable to paddle. Absolutely the easiest canoe I've ever paddled to get great rides. So that's what I could say...no doubt one of my favorites, if not the favorite of all that I've owned. And that's been a bunch, including all the new ones." Check out our Kahele inventory here!